Limited edition of 2008 prints 20" (524mm) x 29" (723mm), September 2008. In February 2007 I decided to reacquaint myself with the streets and buildings of the capital city, that I knew well from my previous London paintings. I spent days walking through the heart of the metropolis with my sketch book and camera to hand. This was to build up my library of images, to chart the architectural changes and to awaken my creative intuitions for the new London painting. 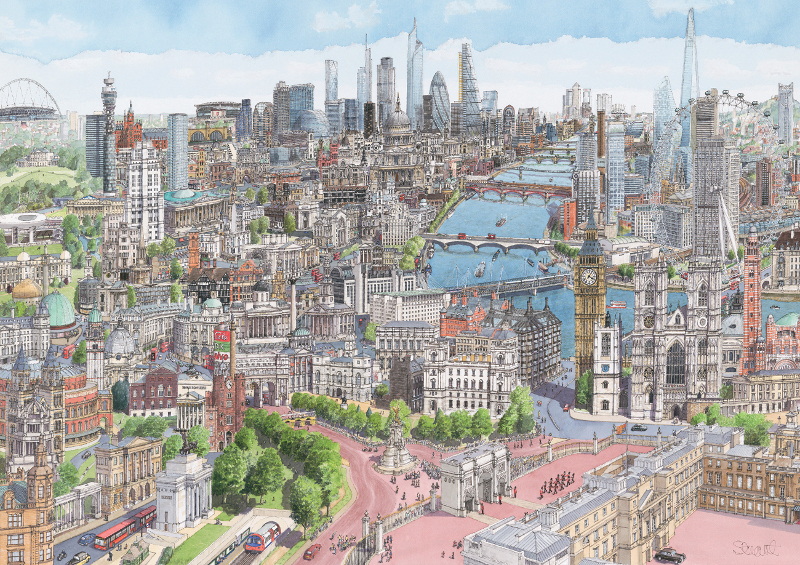 The resultant London print contains more prominent buildings and landmarks than have appeared in my previous London prints. Consequently the work took much longer - a full 17 months - to produce. The picture takes you from Buckingham Palace, Westminster Abbey, "Big Ben" and through Whitehall, along the Embankment to the City, across to St Pancras, past the BT Tower and south through part of Soho and on into Kensington. The South Bank and Thames feature a little more than in my earlier London paintings, along with new and some proposed structures which did not yet form part of the skyline. My London painting is a mixture of panorama and capriccio and which is why I came up with a new word to describe my style; "panoriccio". The composition is imaginary but I have disciplined myself to make the view plausible so that the juxtaposition of buildings has a certain geographical harmony. The title of "London - World City" reflects its growing significance in the world of finance, art, literature, theatre, films, fashion and sport. London after 2000 years of history is still continually adapting to change. Its attraction is strong not just for people who live in these isles but people from every corner of the globe. Hosting the Olympics 2012 is just one indication of this great city's pre-eminence. Each London print measures 20 by 29 inches, and light fast inks were used on acid free paper. The edition is 2008 prints and each one is signed and numbered. A key of the buildings along with a certificate of authenticity is supplied.